In the server side configuration, we will be using AbstractWebSocketMessageBrokerConfigurer to configure our websocket protocol to use STOMP as a message broker and common annotations such as @MessageMapping, @SendTo, @MessageExceptionHandler provided by spring-boot-starter-websocket. This example is using STOMP as a message broker but it is optional and here is an example of spring boot websocket without using STOMP. 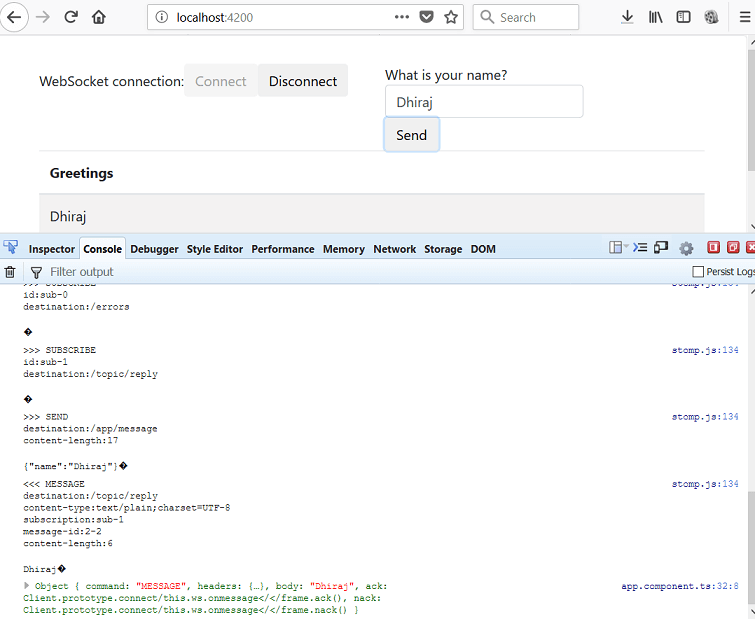 In the client side, we will have an angular application running and connecting to server over websocket protocol. To integrate with websocket, we will be using stompjs library and sockJs library.You can easily extend this example application to create a chat application. Like http, websocket is also a communication protocol which provides bi-directional, full duplex communication channel between a server and client.Once, a websocket connection is established between a client and a server, both the parties can exchange information endlessly untill the connection is closed by any one of the parties and this is the main reason why websocket is preferred over HTTP where the client and server need to exchange informations at high frequency and with low latency because HTTP connection is closed once a requet is served by server and there is a time constraint to open a HTTP connection again. Also, the websocket protocol is bi-directional i.e. a client can subscribe for some event and server can publish the event to the client based on the availability of the event in the server. The spring boot websocket configuration is very much similar to my last article about spring boot websocket. We will have WebSocketConfig.java that has all the websocket and sockJS related configuration. @EnableWebSocketMessageBroker enables message broker and by default spring uses STOMP as a message broker.Hence, this application will be using STOMP as a message broker for websocket communication but you are free to use other messaging protocol such as RabbitMQ or ActiveMQ. Simlarly, the method configureMessageBroker() enables a simple memory-based message broker to carry the messages back to the client on destinations prefixed with "/topic" and "/queue". Hence, from our server side the websocket response will be send to endpoint prefixed with these endpoints and angular client will subscribe to url starting with these prefixes such as "/topic/reply"
Similarly,registerStompEndpoints() enables STOMP support and registers stomp endoints at "/greeting".Doing so, all the websocket messages will be channelised through STOMP and this also adds an extra layer of security to the websocket endpoint. Remember that, while creating websocket connection from javascipt, we will be using this particular stomp endpoint i.e. let socket = new WebSocket("ws://localhost:8080/greeting");only. Now let us define our controller for mapping the messages to be received over websocket protocol. @MessageMapping: This isto map the message headed for the url /message. So, the client should send the message at /app/message as per our WebSocketCOnfig.java. Let us first generate our angular 5 project using angular cli. Make sure you have Node JS installed on your machine.A step by step configuration and tutorial on Angular is available here. Now let us install stompjs and socksjs library first using NPM. 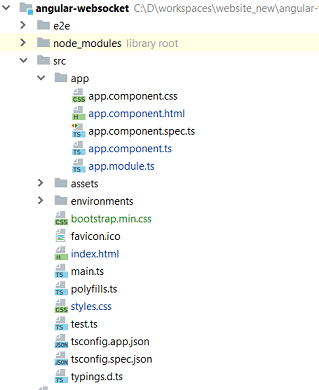 This will add dependencies in the package.json. Now, let us define our html code.The html we have has two buttons for connect and disconnect websocket connection. Similarly, the send button will send the name to server over websocket protocol in a JSON format and the server will extract the name out of it and sends back to topic which is subscribed by the client. Similarly, we have following typescript code. The connect() will create a web socket connection. Remember the mapping we did in WebSocketConfig.java class for /greeting. showGreeting() will be simply showing the message received by the server broadcast. send() function will construct a JSON message and sends message to the server.